STEPHEN CURRY, Golden State Warriors #30 / Point guard. Everyone knows Stephen Curry is the son of former NBA player Dell Curry but did you now Stephen Curry's mother is Haitian-American? Stephen Curry's mom Sonya is the daughter of a Haitian woman named Candy? Mommie was born in Virginia but grand'ma is Haitian. SETH CURRY, Dallas Mavericks #30 / Shooting guard / Point guard. 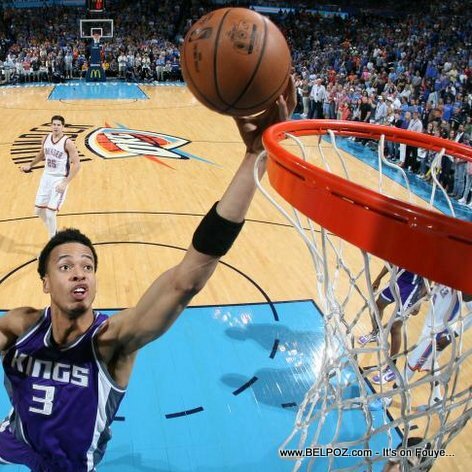 SKAL LABISSIERE, Sacramento Kings #7 / Power forward, Center. NBA draft 2016 / Round: 1 / Pick: 28th overall, Selected by the Phoenix Suns. Labissiere was traded to the Sacramento Kings on draft night. Labissiere is the highest drafted Haitian player since Samuel Dalembert in 2001. Labissiere played NCAA Division I college basketball for the Kentucky Wildcats. Labissiere was born in Port-au-Prince, Haiti. His basketball career began at the College Canado-Haitien. BLAKE GRIFFIN, Los Angeles Clippers #7 / Power forward. Blake Griffin is of Haitian decent. Griffin was born on March 16, 1989, in Oklahoma City, Oklahoma, to Tommy Griffin, who is of Afro-Haitian descent, and Gail Griffin, who is Caucasian. Griffin was selected first overall by the Clippers in the 2009 NBA draft, and has since been a five-time NBA All-Star and a four-time All-NBA selection. NBA draft	2009 / Round: 2 / Pick: 48th overall, Selected by the Phoenix Suns. Taylor Griffin is of Haitian decent. He is the big brother of Bake Griffin, Taylor Griffin was born on April 18, 1986, in Oklahoma City, Oklahoma, to Tommy Griffin, who is of Afro-Haitian descent, and to Gail Griffin, who is Caucasian. NERLENS NOEL, Dallas Mavericks #3 / Power forward, Center. NBA draft 2013 / Round: 1 / Pick: 6th overall, Selected by the New Orleans Pelicans. Nerlens played NCAA Division I college basketball for the Kentucky Wildcats. Nerlens was born in Malden, Massachusetts to Haitian immigrant parents. NBA draft 2001 / Round: 1 / Pick: 26th overall, Selected by the Philadelphia 76ers. Dalembert played for the Philadelphia 76ers, Sacramento Kings, Houston Rockets, Milwaukee Bucks, Dallas Mavericks, New York Knicks, Shanxi Zhongyu. OLDEN POLYNICE, NBA draft 1987 / Round: 1 / Pick: 8th overall, Selected by the Chicago Bulls. Polynice played center for the Seattle SuperSonics, Los Angeles Clippers, Detroit Pistons, Sacramento Kings, and Utah Jazz. Polynice was born in Port-au-Prince, Haiti. YVON JOSEPH, NBA draft 1985 / Round: 2 / Pick: 36th overall, Selected by the New Jersey Nets. Joseph was the first native Haitian to play NCAA Division I college basketball in the United States. He played collegiately at Georgia Tech. Is NBA player Keven Durant of Haitian decent? There's been on going discussions about that since 2007. Some say Keven Durant got the last name Durant from a Haitian man the mother was dating after his father left. Other's swear he is Haitian because Mama Durant has a Haitian heritage.